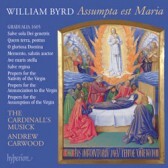 All of the music on this disc is drawn from the first volume of Gradualia published in 1605, in which the Byrd’s overtly Catholic agenda is clearly displayed. These pieces show a glimpse of the man that is rather different from our more usual perception of the composer racked with misery at the deprivation of Catholics in England. Relaxed and confident, he indulges his considerable wit and imagination, and employs the most up-to-date musical styles. Here there is no wringing of hands, nor downcast eyes but rather the musical embodiment of an unshakeable faith.